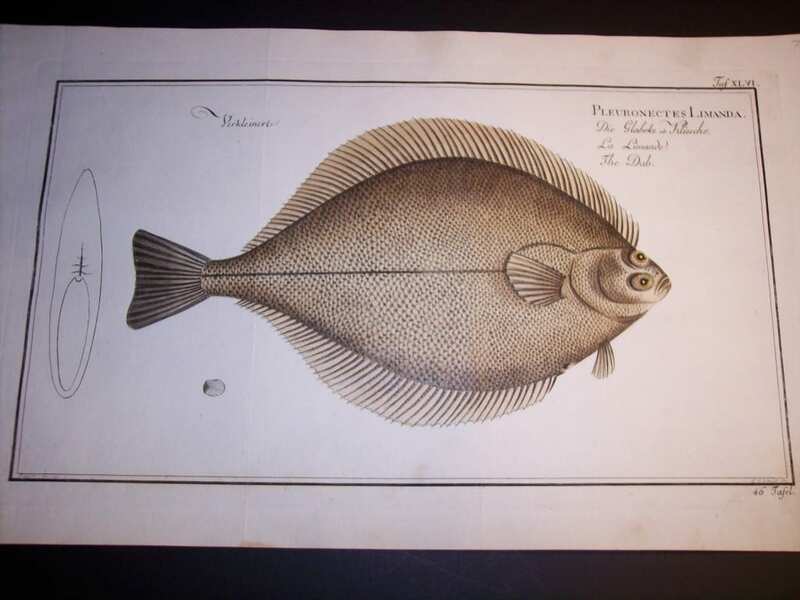 Buy Elieser Bloch Fish Engravings from one of the leading rare antique prints galleries in America. Please contact me for a customized assortment to select from. They will compliment your oceanside and lake home. 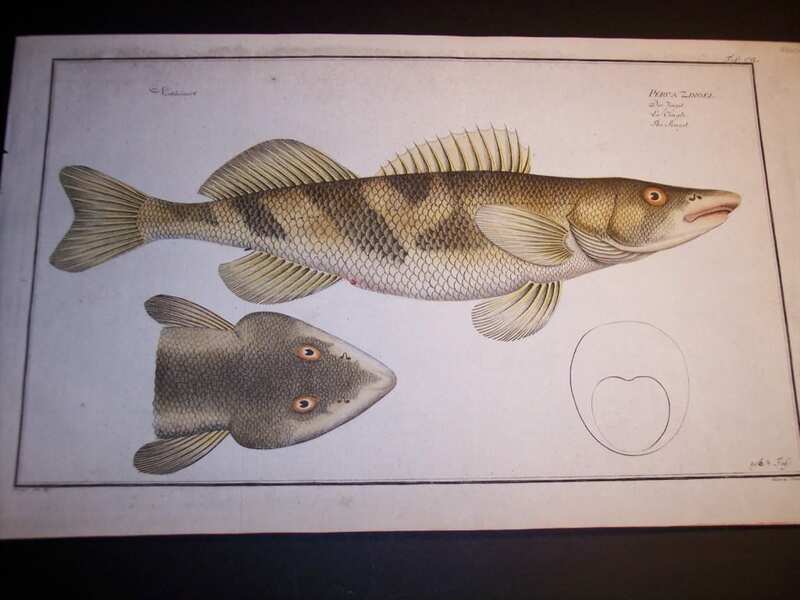 If you are looking for distinctive wall hangings and antique art of fish, you will find them here at Anne Hall Antique Prints. Each piece was published from 1772-1785 in Berlin, Germany. Each measures about 9 1/2 x 16″. The antique engravings are bright, hand water coloured, copper plate engravings, on hand made, hand laid rag. Please inspect the photos carefully, some have old folds. Order 2 or more for a discount! Phone 413-245-4197 or Click here to contact us. 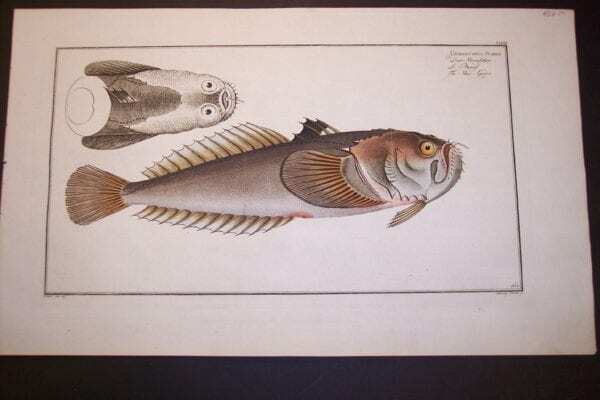 Ostracion Concatenatus Marc Elieser Bloch Fish Engraving $850. Scoraena Horrida or Scorpion Fish. Marc Elieser Bloch Fish Engraving $850. Raia Torpedo a Marc Elieser Bloch Fish Engraving. $600. 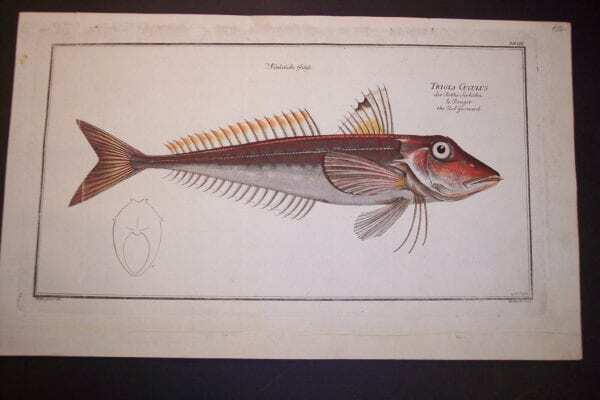 Tetrodon Spengleri Marc Elieser Bloch Fish Engraving $700. Pleuronectes Limanda. 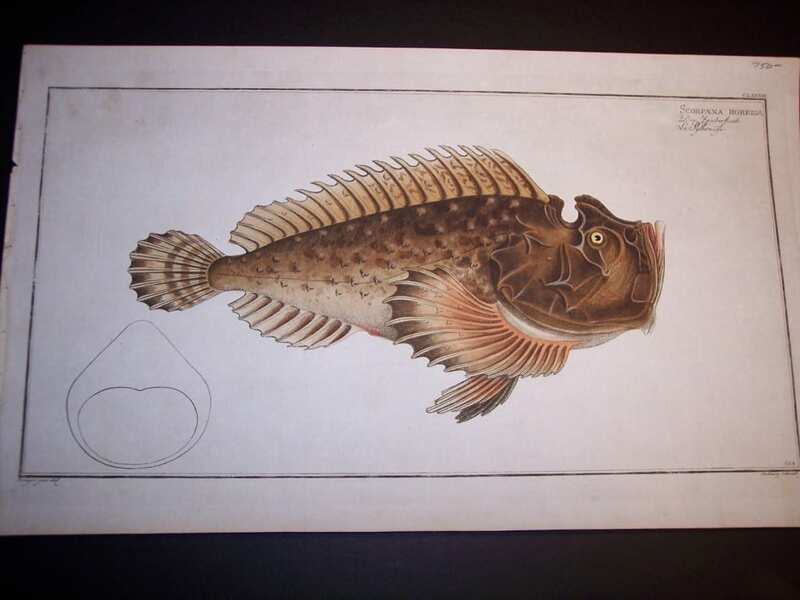 An exquisite Marc Elieser Bloch Fish Engraving $750. 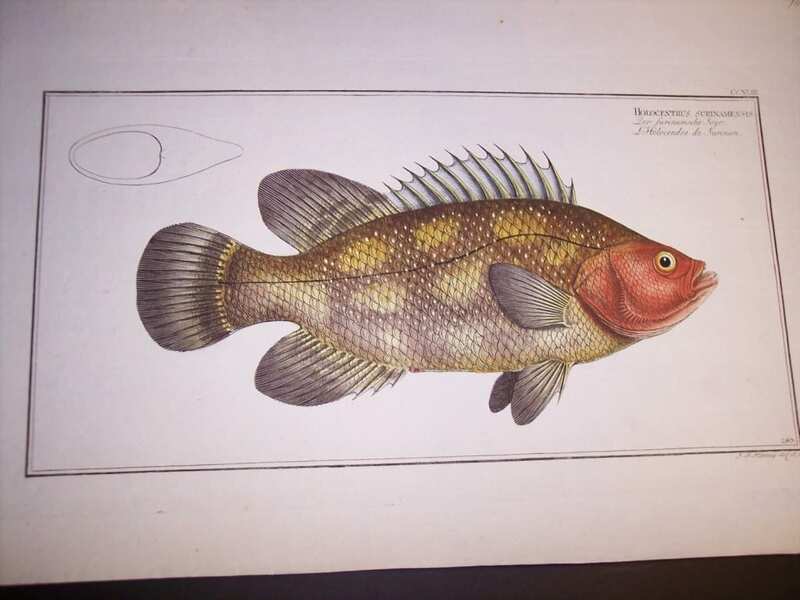 Holocentrus Surinamensis a Marc Elieser Bloch Fish Engraving. $1000. 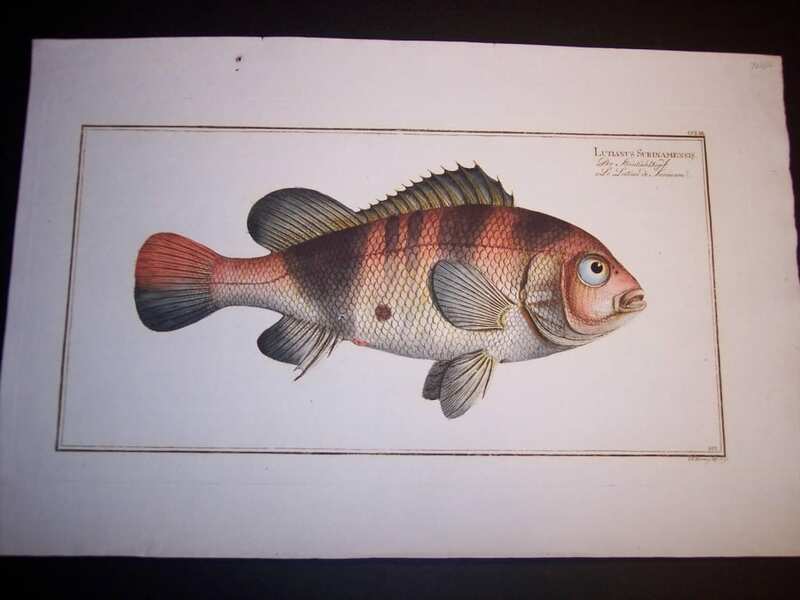 Lutianus Surinamensis a Marc Elieser Bloch Fish Engraving $900. Hairy Angel Fish or Chaetodon Ciliaris Marc Elieser Bloch Fish Engraving $1000. Cyprinus Tinca. 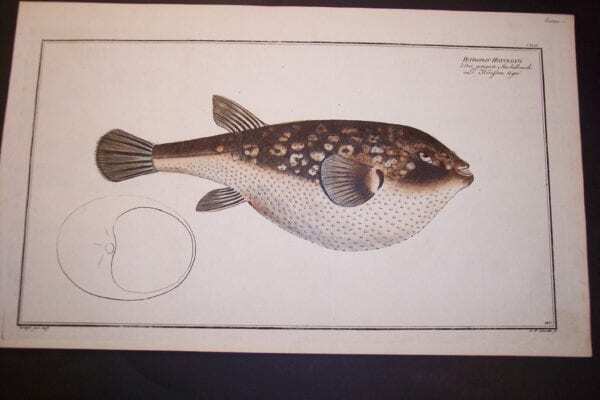 a Marc Elieser Bloch Fish Engraving. $450. 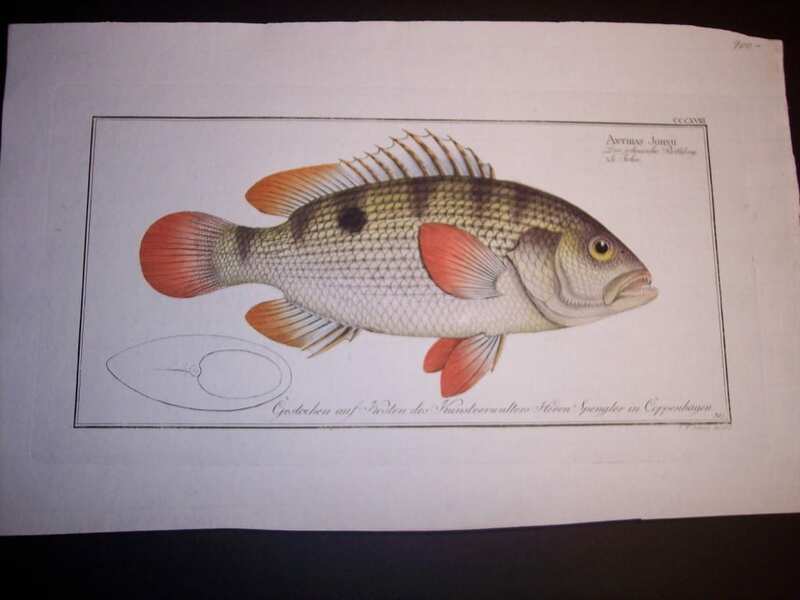 Anthias Johnii Marc Elieser Bloch Fish Engraving. $900. 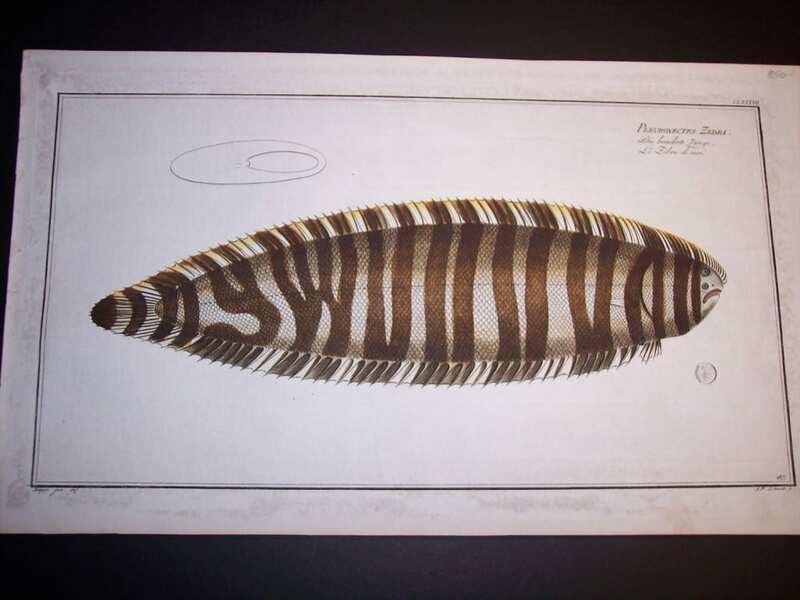 Zebra of the Sea, or Striped Flounder, a Marc Elieser Bloch Fish Engraving. $850. 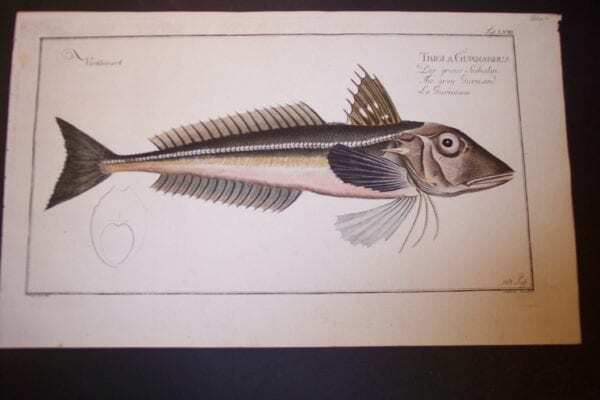 Pleuronectes Bilineatus, a Marc Elieser Bloch Fish Engraving. $500. 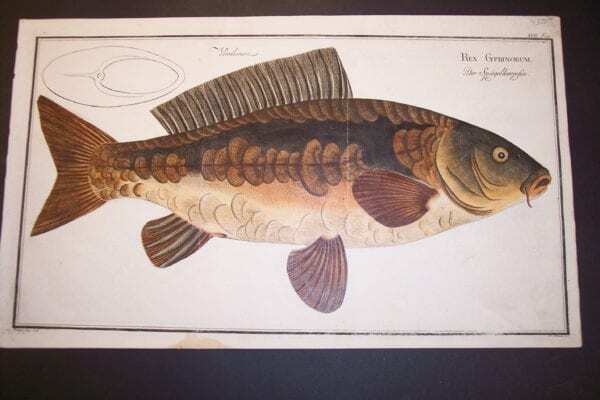 Rex Gyprinorum a Marc Elieser Bloch Fish Engraving. $600. 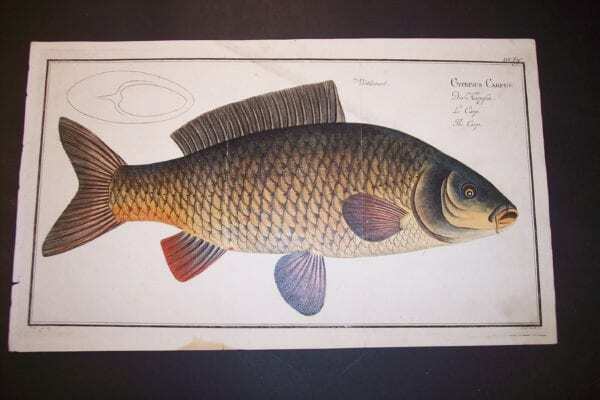 Cyprinus Carpio, a Marc Elieser Bloch Fish Engraving. $500. 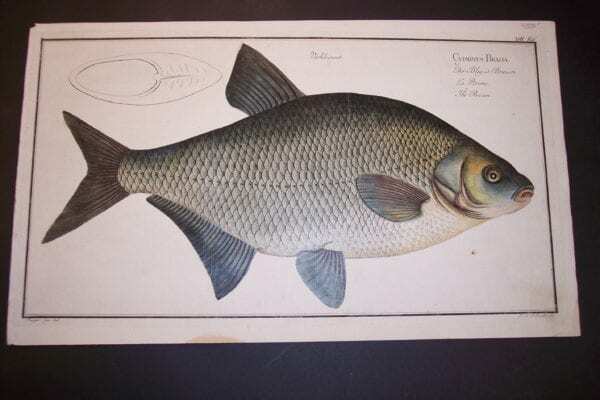 Cyprinus Brama, a Marc Elieser Bloch Fish Engraving. $650. 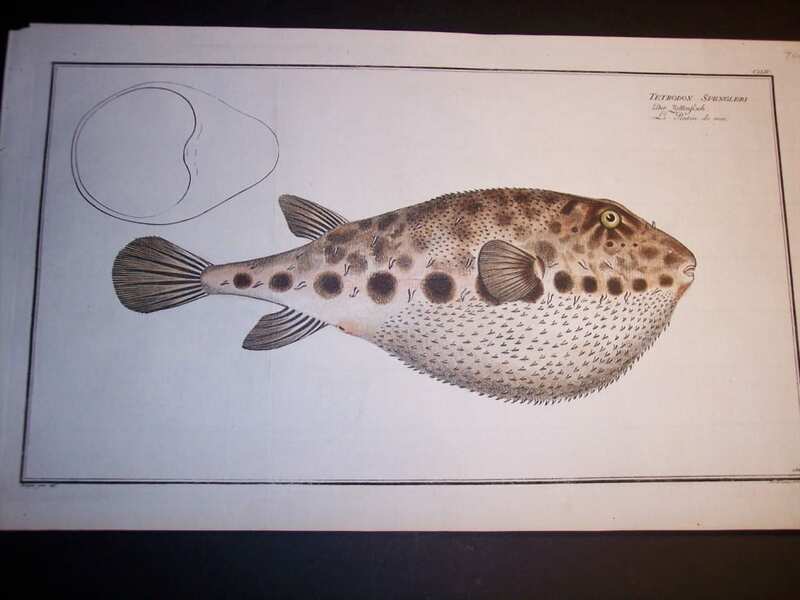 Anarhichas Lupus, a Marc Elieser Bloch Fish Engraving. $600. 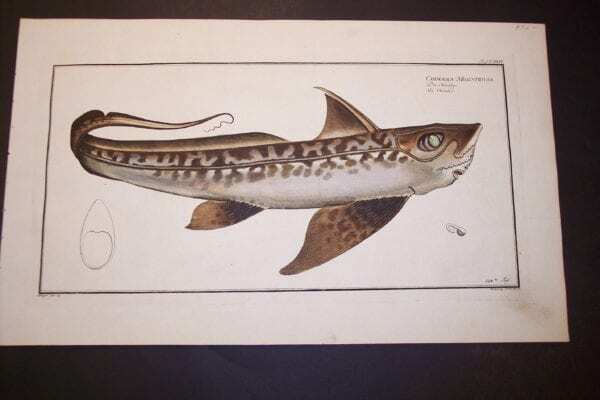 Blue Shark or Squalus Glaucus a Marc Elieser Bloch Fish Engraving. $650. Note: Added margin right side. Bloch Fish Pl. 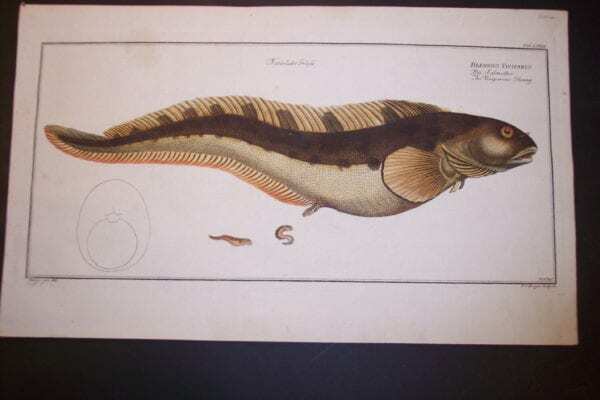 CXLIII Tetrodon Honckenu Herifson Tigre, a Marc Elieser Bloch Fish Engraving. $500. 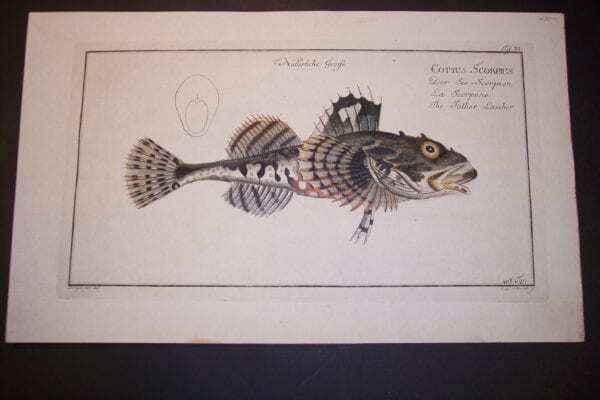 Perca Zingel, a Marc Elieser Bloch Fish Engraving. $450. unreal ? 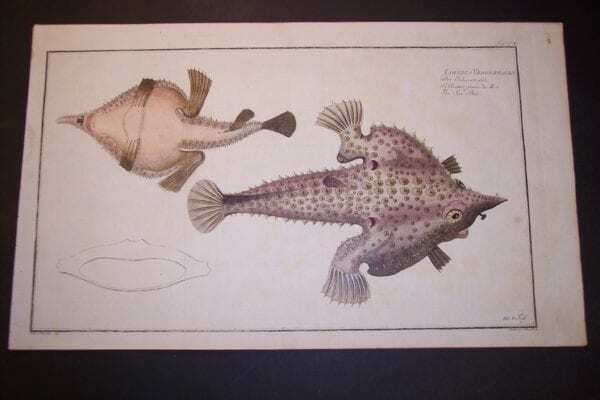 Frogfish Sold… a Marc Elieser Bloch Fish Engraving. Bloch Fish Pl. CLXVII Blennnius Ocellaris Butterfly Fish $400. 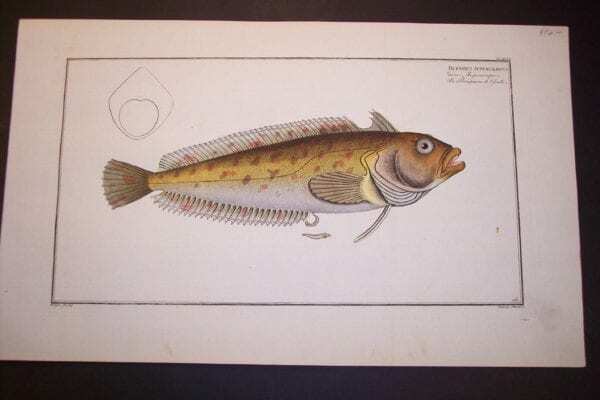 Cottus Scorpius, Call for availability, a Marc Elieser Bloch Fish Engraving. 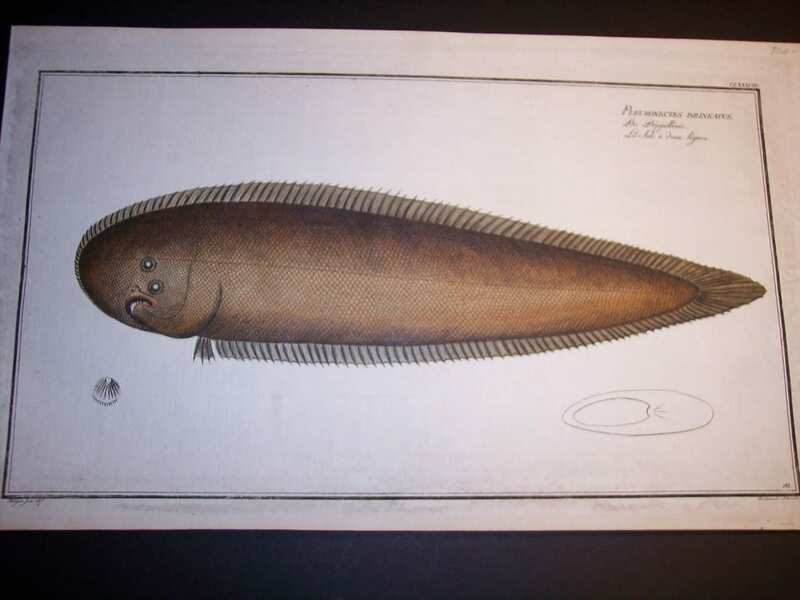 Trigla Cuculus, a Marc Elieser Bloch Fish Engraving. $400. 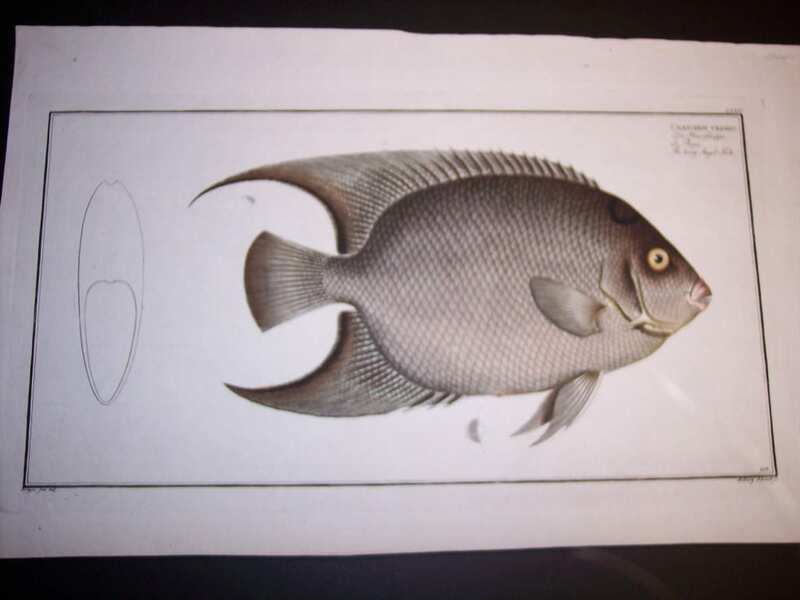 Chaetodon Pavo, a Marc Elieser Bloch Fish Engraving. $450. 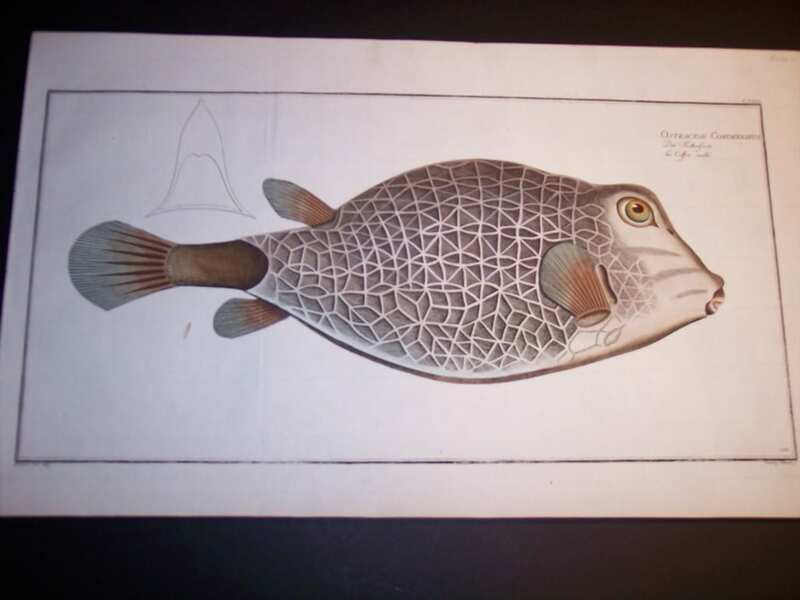 Trigla Gurnardus, a Marc Elieser Bloch Fish Engraving. $400. Bloch Fish Pl. CLXVIII Blennius Superciliosus Pierce Pierre. 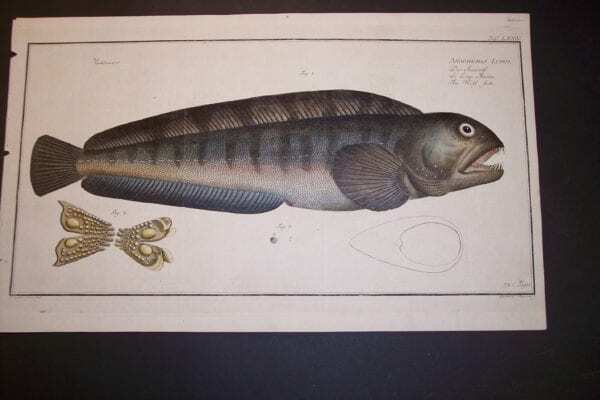 a Marc Elieser Bloch Fish Engraving. $450. Bloch Fish Pl. 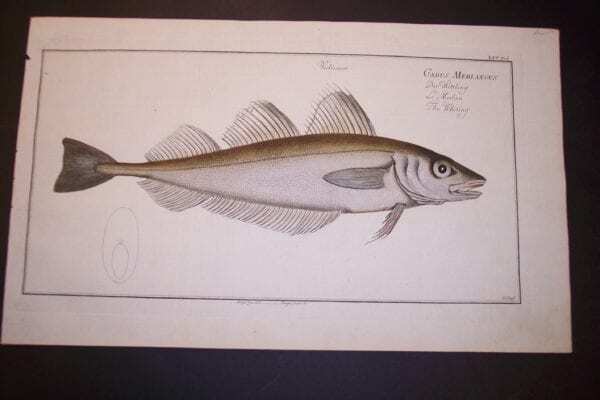 CLXIV Gadus Merluccius The Hake $450. Bloch Fish Pl. CLXIII Uranoscopus Scaber Star Gazer. 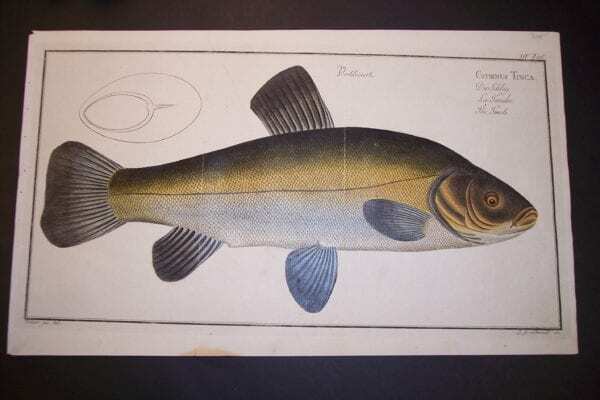 a Marc Elieser Bloch Fish Engraving. $450. Bloch Fish Pl. 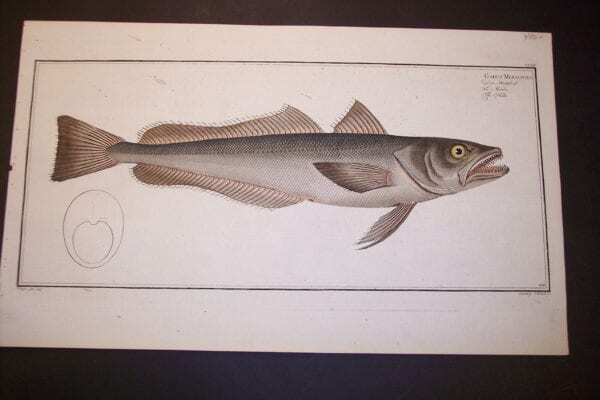 LXV Gadus Merlangus The Whiting, a Marc Elieser Bloch Fish Engraving $400. Bloch Fish Pl. 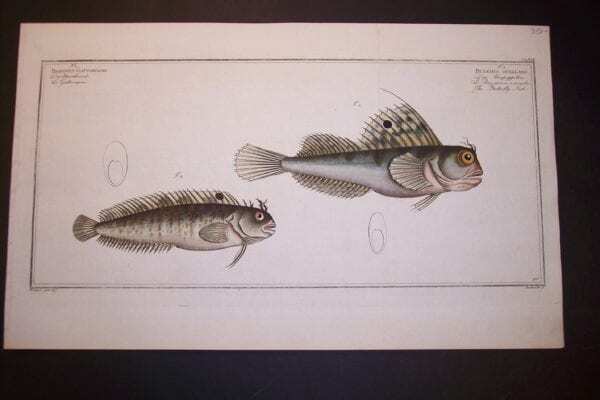 LXXII Blennnius Viviparus Viviparous Blenny, a Marc Elieser Bloch Fish Engraving. $350. Bloch Fish Pl. CXXIV Chimaera Monstrosa La Chimere, a Marc Elieser Bloch Fish Engraving. $500. . These fish will add a classic and modern feel to your home. 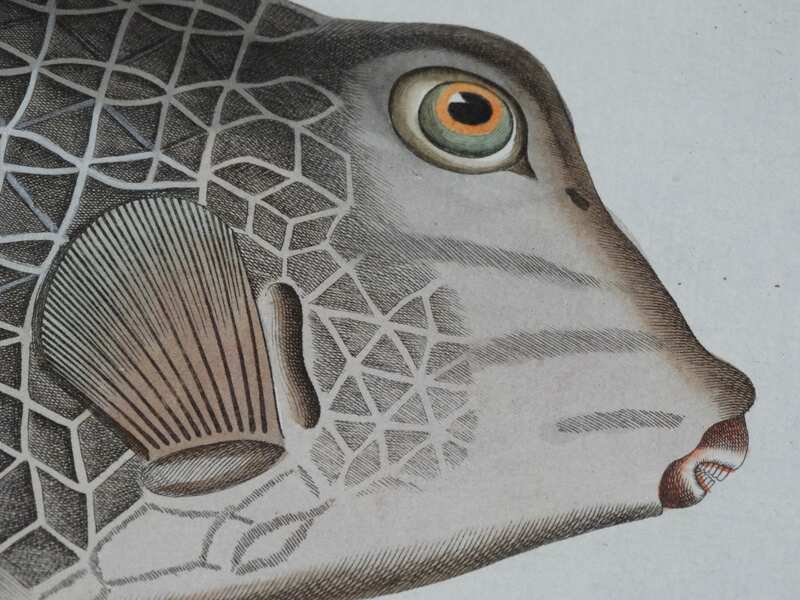 Published during the 18th Century, in Nuremburg, Germany from 1772-1778, these wonderful fish engravings are considered to be the finest of all fish prints ever produced on the subject of fish. Not only are these beautiful because of the metallic water colouration but because the water colors were executed so well. Hand Colored Copper Plate Engravings. Considered to be rare in the rare book world, the plates are far and few between. 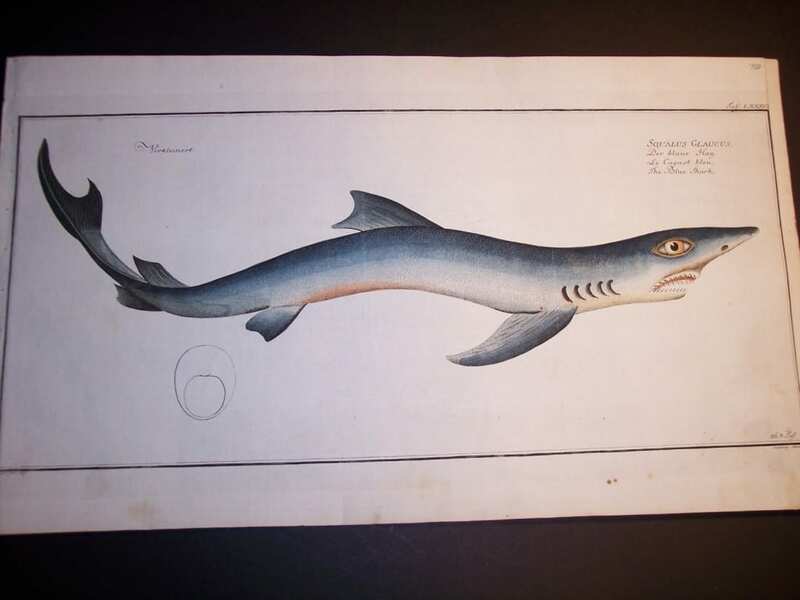 These rare hand colored antique engravings were produced in Germany from 1772-1778. 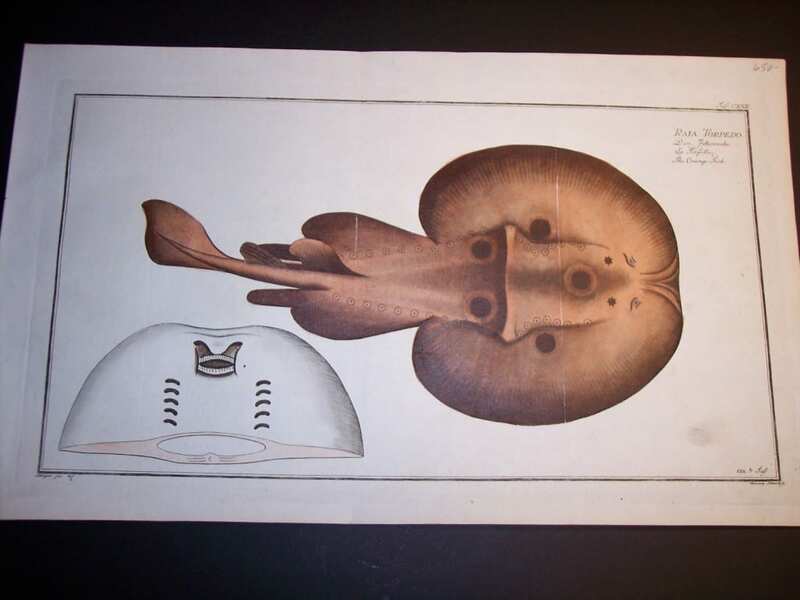 The fish prints Bloch produced are considered the finest work on the subject of Ichtyologie. These are hand colored copper plate engravings on hand made hand laid linen rag. 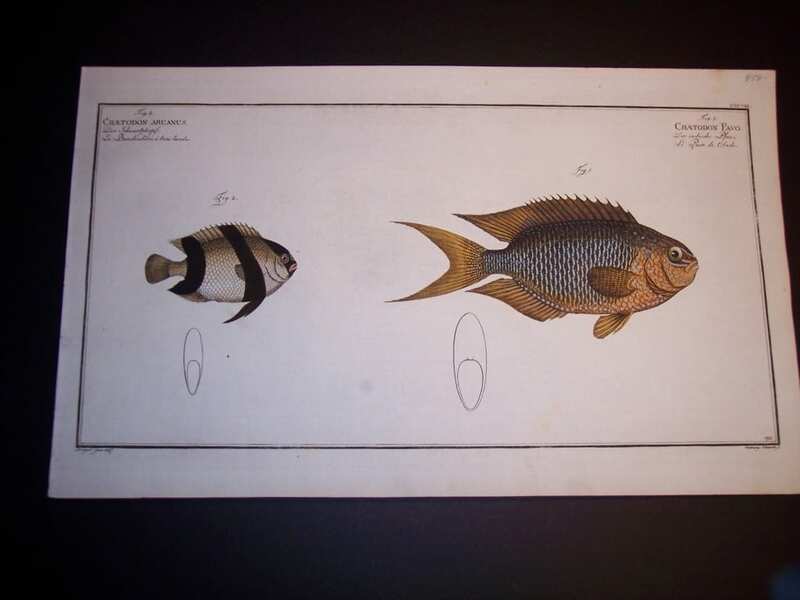 The water coloring in the Ichthyology illustrations pictured here, is no less than excellent! The history of antique printing methods of the 16th, 17th, 18th and 19th Centuries is very interesting. My website consists of old prints, published in obsolete printing methods, that really do not exist today. The entire subject revolves about how fast information could be published for readership. Readership in the old days revolved around money and new discoveries, especially in the area pertaining to natural history. If one could discover a new species of fish… Wow! That would boost the desire for information. It had a trickle down effect. Like today, in the OLD days, desire for information lead to wanting more and more information, almost a viscous cycle. Hence the production of publishing. First to publish religious material. Only the high priests could convey the printed messages. This lasted for a long time. Around 1800 or so, more people read. It was fashionable to be educated. Everyone could understand a beautiful illustration. They did not have to understand the words, but it encouraged understanding. Soon, the publications became subscriptions, everyone wanted them. Like today, everyone wants the latest devise. Initially periodical subscriptions were made to those who could afford it: royalty, clergy, noblemen, etc. Who could read? The answer is only the educated, super wealthy, religious, clergy, nobility, etc… Oftentimes on expeditions, specimens were collected and captured, many alive, many did not survive the journeys home, nor the conditions when relocated. Many journeys were three months at sea. In the 18th and 19th Centuries museums of curiosities became the rage. Hoards of people would rush to museums to see exotic specimens brought home from expeditions of early explorers and naturalists. Royalty, Clergy financed explorations and hence the illustrations, publications that developed from trips. Often times young men, early scientists, aboard ships recorded the natural history sightings they saw along the way. They recorded every detail of the natural history specimens they came across. All of this absolutely fascinated the public. And so the history of illustration, depicting and describing what had been found, along these tremendous explorations was found. How fast the information moved forward can be seen through the history of printing. Exactly as the way things are moving forward these days, so did printing history. It started with very slow laborious hand drawn pages by scribes and monks onto velum, to copper plate engraving on hand made hand laid linen rag paper, and moved forward to faster and faster printing, from lithography, hand colored or not to printing in colors, chromolithography. All driven by readership subscriptions. It all ended about 1900. when photographic printing became the 20th century tool, to today, when everything is digital and untouchable on the internet. Nuts, Antique Lithographs, Chromolithographs. Pecans!